I have recently become a huge fan of lettuce wraps. It is a great way to eat a healthy meal minus the carbs. They are also great for entertaining because you can make a huge platter and everyone can serve themselves. That being said if you don't love lettuce wraps you can easily sub out the lettuce and use flour or corn shells to make tacos. If you want to add meat I would recommend using ground turkey, chicken or beef. They really are awesome without the meat though. This recipe came about as a way to clean out our fridge. Every week on taco night I make a big batch of black beans in the slow cooker so I always have extra on hand. You can most definitely use canned black beans or canned refried beans for this recipe but slow cooking the dried ones tastes so much better and it is really easy too. If you make a big batch every week or two you will always have some on hand for quick dinners. I love the combination of the creamy green goddess dressing with all the crisp veggies, and spicy beans. It is such a great flavor combination. I eventually want to try and make my own green goddess dressing but I used store bought this time. Heat about 1 tablespoon olive oil in a skillet and add in the squash and zucchini. Season with salt and pepper and cook on medium heat about 5-10 minutes until they are slightly cooked. Remove from heat. Bring water to a boil with corn and cook about 15 minutes until corn is cooked but still slightly firm. Remove corn from water and cut off kernels. Reheat spicy black beans and I like to mash them as they cook. Wash the lettuce leaves and arrange on platter with other ingredients. Layer black beans, corn and zucchini\squash mixture. Then top with cherry tomatoes, green onions, avocado, and crumbled cheese. 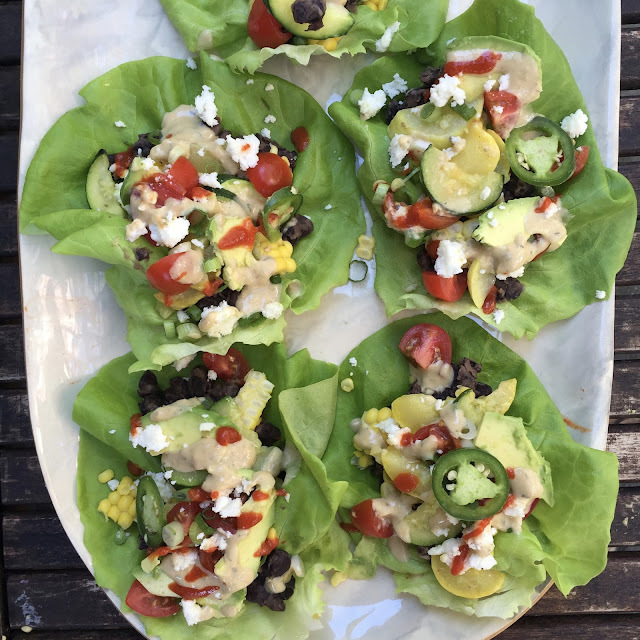 Drizzle with green goddess dressing and hot sauce. Place the black beans in a pot on the stove filled with water. Bring to a boil then turn off the heat and then let them sit covered 1-2 hours. This helps the black beans cook quicker. You can place them straight in your slow cooker but keep in mind they will need all day to cook prob at least 8-10 hours. Black beans cook really slow and by boiling them first it helps speed up the process a little bit. After an hour or so dump the beans and the water into your slow cooker. Add the next 6 ingredients. I always cook mine on high for 4 hours first and then I switch to low until they are ready. When the 4 hours on high are done add in butter and then switch the setting to low. I usually cook another 3-4 hours or until we are ready to eat. Taste the beans and season to make sure they have enough salt and pepper. Looks so unique and delish! I agree, lettuce wraps are the best! everything about these two recipes is perfection. Making them both this weekend for sure! Yum! Will have to make these and thanks for including the black beans recipe, too. Ina Garten has a great Green Goddess Dressing recipe that I've made before. Are the black beans too spicy for kids?